An unusual calm on Bogota’s streets. Photo by Pattoncito from Flickr. 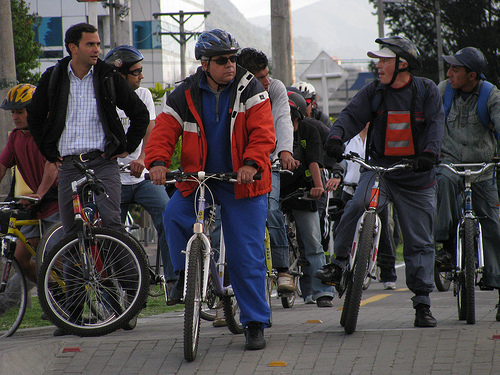 On Thursday, February 7 Bogotá held its 8th annual car-free day during which 14% of the population left their private cars at home and walked, cycled, and took mass transit to get around Colombia’s capital city. The car-free day is a bold effort to give people the chance of experiencing how nice the city could be without the 1.2 million private vehicles that ply Bogota’s streets every day. 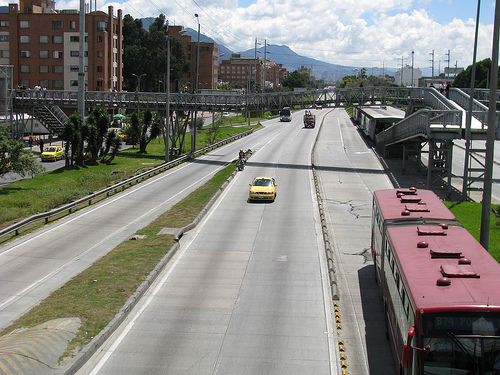 Following Bogota’s lead the car-free movement is spreading throughout the world, but still, this Andean city is the only one of its size that actually enforces its efforts, slapping $118 fines on any vehicle breaking the ban. The Colombian newspaper EL TIEMPO reported a 45% reduction in carbon monoxide, an improvement attribute to the absence of private cars. This reduction, while important, was overshadowed by a 42% increase in particulate matter. Particulate matter is inorganic particles caused by diesel engines, brake and tire friction, wood burning factories using heavy fuels and coal, and forms indirectly in the air from SOx and NOX. Particulate matter has serious effects on the human respiratory system, and is especially harmful to children, the elderly and people with breathing problems. It is also one of the leading causes of bronchitis and asthma. At typical concentrations, particulate matter has approximately the same impact on human health as carbon monoxide. However, per equal mass emitted, it has between a 10 times (if its from brakes and tire friction) and 1000 times (if its from diesel engines and SOx) greater impact on human health than carbon monoxide. For Bogotá, the really important question is whether the particulate matter which increased during car-free day was from brakes and tires or from diesel engines. If it was from breaks and tires then it will be removed quickly from the atmosphere, and we could argue unequivocally that car-free day improved human health. However, if it’s from diesel engines and Sox – as it is believed to be in the case of Bogota – then the increase in particulate matter may have outweighed the benefits from reduced levels of carbon monoxide. Crowds of people rode their bikes to work. Photo by Pattoncito. There seems to be a consensus among transportation and environment experts that Bogotá’s annual experiment is worth it, even if the only outcome is elevating the topic of air quality into the public discourse. In my opinion Bogotá deserves to be applauded for being at the fore front of such a movement, one that provides the residents of Bogotá an opportunity to experience the sights and sounds of a car free city. Viva Bogotá!